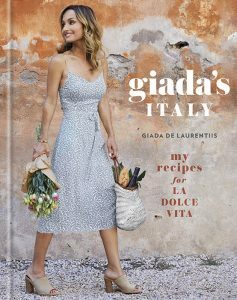 Food Network superstar and bestselling cookbook author Giada De Laurentiis speaks from the heart in this fun show recorded on location in Madison, CT during the R.J. Julia Booksellers “An Evening with Giada De Laurentiis” event. Giada shares recipes for Cacio e Pepe, Grilled Scallops with Prosciutto, and Grilled Chicken Involtini—all from her new book, Giada’s Italy. Plus, Faith shares information about the food and wine trip she’s leading this fall through the undiscovered South—Puglia—home to some of Italy’s best food, wine, art, architecture and views.